The Brandt Companies have built a reputation for efficiency and consistency, delivering on time and in budget with unmatched quality. To do that consistently, a company must be built on a powerful values system that clients, partners and employees can believe in. Our values as a company align our employees around central commitments to our customers, the communities we serve and the environment in which we all live. However, our dedication to care isn’t only related to our customers. 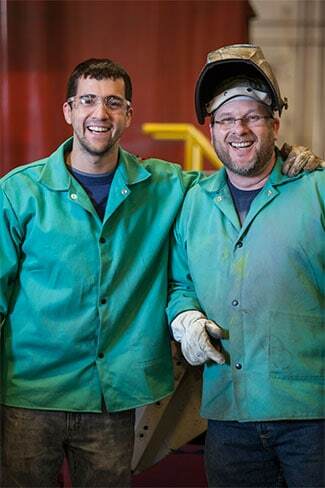 Our employees are the foundation of our company, and we protect one another at every turn. Safety is our top priority on the job, and we work hard to help those who trust us with their careers to find plenty of time for life outside the workplace. Our relationships with customers, vendors and employees are based on respect and honesty. It is our unwavering policy to do what we say we will do, when we say we will do it. From design to construction to service, , integrity is what we demand of ourselves and our team members. We do whatever it takes to live up to our commitments. Over the course of a long and complex project, that means fostering a culture of adaptability and creativity. We understand that construction and working in fully operational facilities can be hard and demanding. We understand that it takes resilience and drive to meet the changing demands of our clients, and we are focused on successfully making it to the finish line. To respond to ever changing conditions, businesses must be able to adapt quickly and easily. Using leading-edge technologies, we proactively manage our work to help us identify problems early and fix them fast. We can’t always predict what will happen, but we are always ready for the challenges that come our way. The Brandt Companies’ core values are the foundation on which we have built our business. They guide how we conduct ourselves daily and keep us on course in an ever-changing world. They underlie our work, our interactions and our strategic decisions. At Brandt, a spirit of care, integrity, perseverance and agility has guided us to more than 60 years of success.